This vinyl memory focuses on my senior year of high school; a couple of hours on a Saturday afternoon in January, 1980, in sunny San Jose, California. No. The needle cuts deeper than that, revolving around a formative period of my life, which began on the threshold of entering the sixth grade at West Middle School, when I was asked which instrument I wanted to play. In a previous “vinyl memory” I wrote about my dad and aunt’s musical pursuits during their youth. Aunt Shirley’s kids – my cousins – were both older than me, and had taken up musical instruments. Robby played the trumpet, and Al the drums. I suppose it was natural or expected of me to follow along. I randomly chose the trumpet. At West Middle School, the band director was Mr. Driftmeyer. 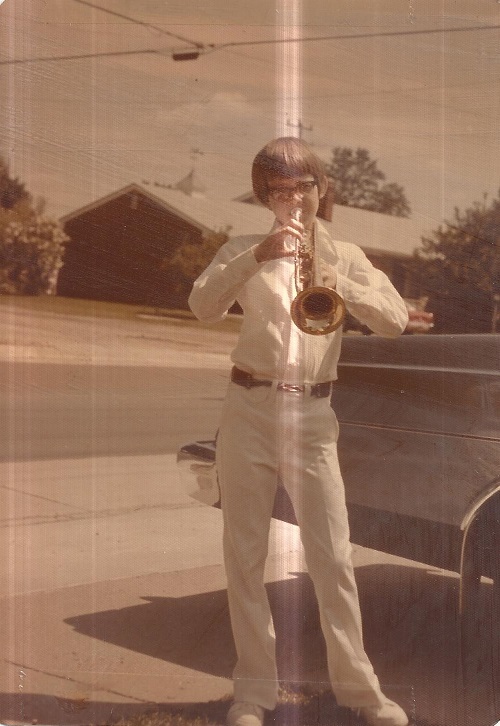 Early on I became motivated to practice not because it was a joy to sit in my room and blurt out notes from an elaborate brass bugle foist upon me, or that I had a desire to become the next Herb Alpert. No. Fear motivated my practice. Fear of being embarrassed and humiliated by Mr. Driftmeyer before everyone else in the room. I was that shy, quiet kid that stayed out of the spotlight. I practiced out of emotional self-defense. In the 7th grade, I was a teacher’s aid for Mr. Driftmeyer. Myself and two other students were charged with the task of setting up the chairs for the band that was scheduled for the following hour, and to practice. The extra practice was noted and Mr. Driftmeyer moved me up into the 8th grade band. There was one piece of advice he gave to me which I should have taken at the time. He suggested that I change to the baritone, because he felt my embouchure was better suited for the larger brass horn’s mouthpiece. Yeah, like that was going to happen. 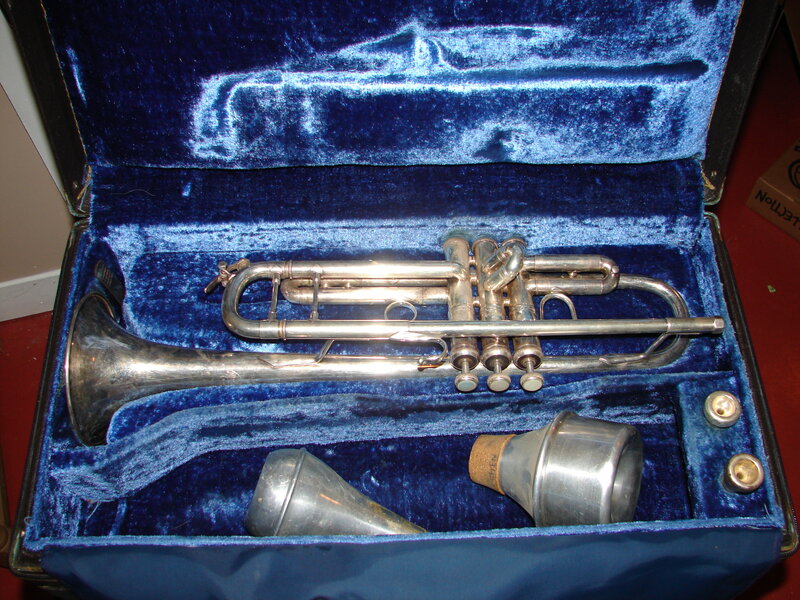 At the end of sixth grade, my parents shelled out to buy me a Bach Stradivarius – a top-of-the-line trumpet that only two other kids in the school had. And they had been paying for weekly private trumpet lessons for me with a University of Michigan trumpet player. Switch to the school-provided baritone after all that initial investment? Wasn’t going to happen. So, in 7th grade, instead of having lunch with the kids in my class, I, and a handful of other 7th graders, had 8th grade band. Then we had lunch with the 8th graders. 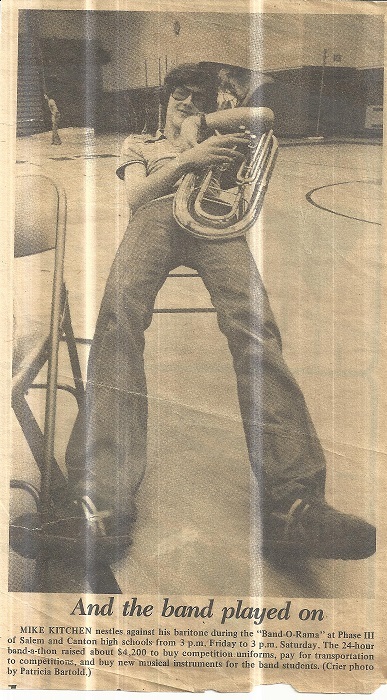 In 8th grade, I sat among the top three or four trumpets in the band. High school was a different beast. The big leagues of the Plymouth musical programs. There were four bands – Symphony, Concert, Varsity, and Cadet. Each year, you had to tryout to determine which band you would be placed in. Symphony was the top band, and once you placed there, you didn’t have to tryout ever again. Concert Band was the second best, Varsity the third, and Cadet the lowest. The Cadet Band was so low that it did not participate in the annual “Variety Is…” end-of-year band program which featured the other three and the two extracurricular bands – Jazz and Marching. Everything seemed to be in my corner. I had done well in middle school. The person judging the auditions for the trumpets was Mr. Driftmeyer. It should have been anxiety-free? But for some reason, I choked. I was horrible. I was so nervous that I lost all composure and cried through the audition. My freshman year of high school, I was in the Cadet Band. The two other extracurricular bands in the high school – Jazz Band and Marching Band – also had to be auditioned for. I had no interest in being in the Jazz Band. It was a smaller, select group of skilled musicians that improvisation came to them as easy as meter and rhyme to the poet. It was difficult enough to play the music before me and blend well with the larger group. But to give me a spotlight and a moment to let unrehearsed music flow from me? Not my scene, man. Marching Band I did try out for, and was accepted. This started with a week at Band Camp just before school began, in Northern Michigan. That was hell. See, I’m the kind of guy that thinks roughing it is staying a hotel without WiFi. And I prefer my privacy. Bunks, dorms, woods, communal showers and bathrooms? Oh holy hell. Then, every week during the football season, it would be practice after school to prepare for the show we’d put on for whichever high school’s team had a football game – Plymouth Salem or Plymouth Canton. Then it became more challenging when the band went into the Marching Band competitions. Plymouth entered the competition realm in either my sophomore or junior year, and they would take place on the weekends at different sites around the state. Tryouts came at the end of my freshman year, and I vaulted into the Concert Band. 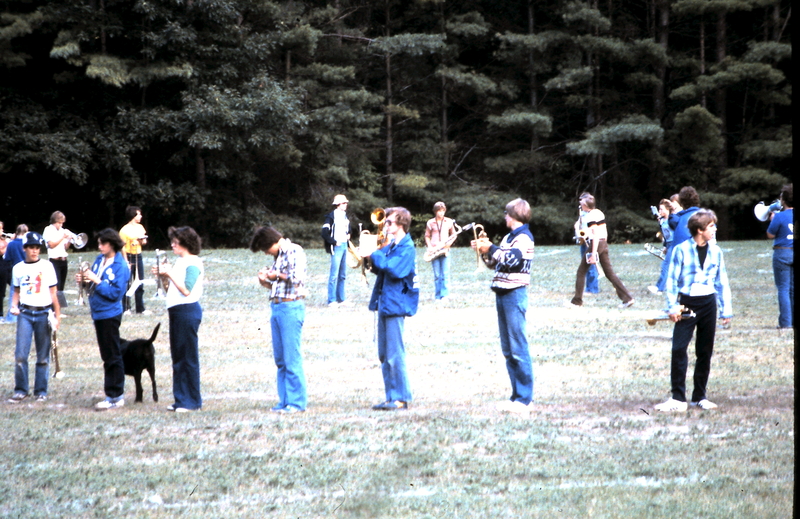 The Plymouth Centennial Educational Park’s Band program was heavily supplied with trumpet players. However, there was a scarcity of baritone players. 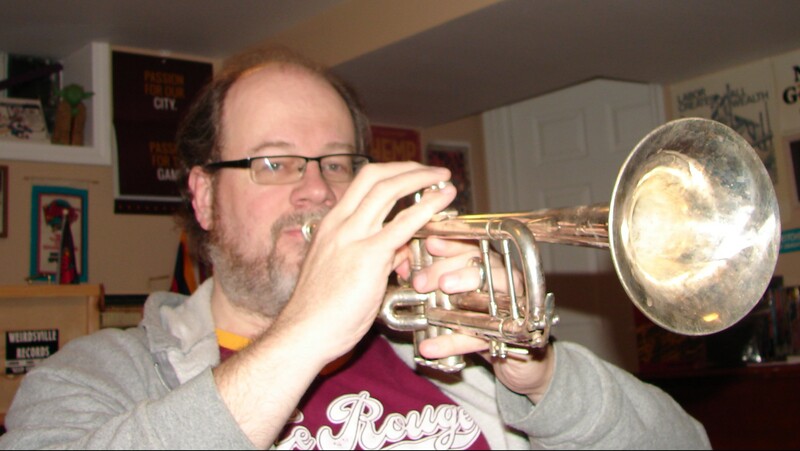 Two of us – Mark Zamarka and I – decided to take on the challenge to learn the baritone. He was a freshman and was in the marching band as well. At the end of the year, we auditioned and earned our spots as the baritone section in the Concert Band. We remained trumpet players in the marching band, and after a full year of finally following Mr. Driftmeyer’s advice, I made it into the Symphony Band my senior year with the baritone. I don’t know what it was about the baritone. Maybe because I could hide behind its more massive brass piping and tubing. I did find it easier to play. There was also a relief from the competition from all the other trumpet players in the school. And baritone solos? 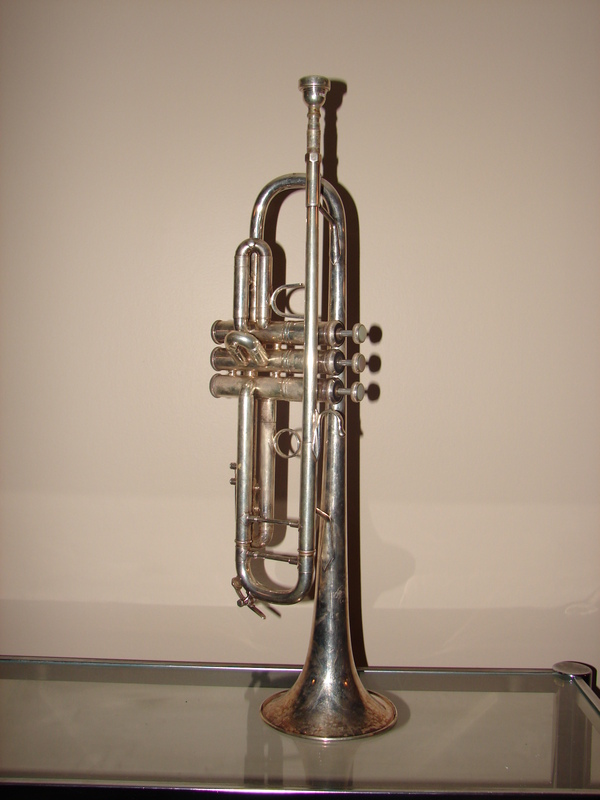 The baritone was not one of the key instruments called upon by composers to feature. If there was anything more terrifying for me than being embarrassed by Mr. Driftmeyer in middle school, it was to be humiliated by Mr. Griffith. Perfection was expected. Except for Marching Band, I had yet to have him as my band director. 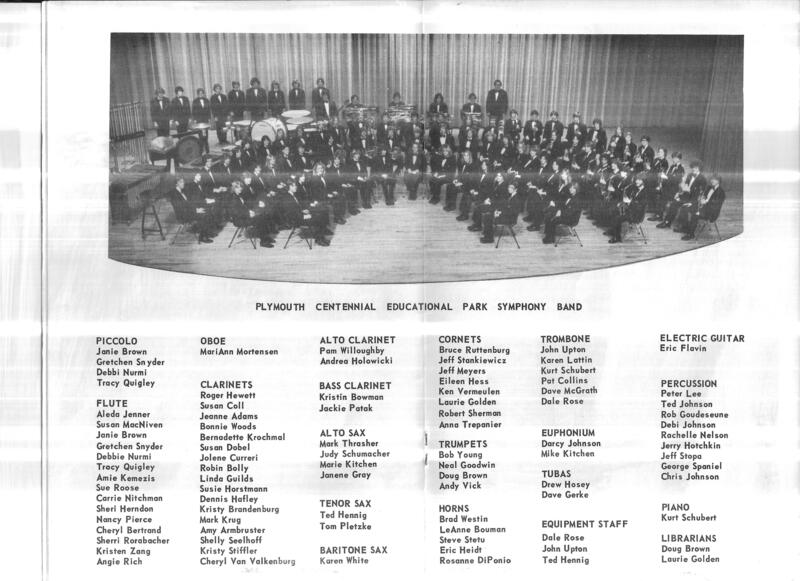 It was Mr. Endres in Cadet Band my freshman year; Mr. Brownlee in Concert Band my sophomore year; Mr. Battishill in Concert Band my junior year; and I’d go out my senior year in Mr. Griffith’s Symphony Band. Mark returned to the trumpet in Concert Band, so I was partnered with a sophomore girl named Darcy Johnson. A dose of additional teen-age anxiety. Me, the guy who discovered that girls in Plymouth weren’t allowed to date until they were sixteen-years-old or out of high school (at least that’s what they’d tell me the few times I muscled up the courage to ask), was to be paired up for a full year with the attractive underclassman. But wait, there’s more. It was my sister, Marie’s, freshman year in high school, and she auditioned and brought her alto saxophone into Symphony Band, too. Making the Symphony Band in my senior year set me up for the trifecta of complete and catastrophic humiliation and embarrassment. Our focus was the clinic. 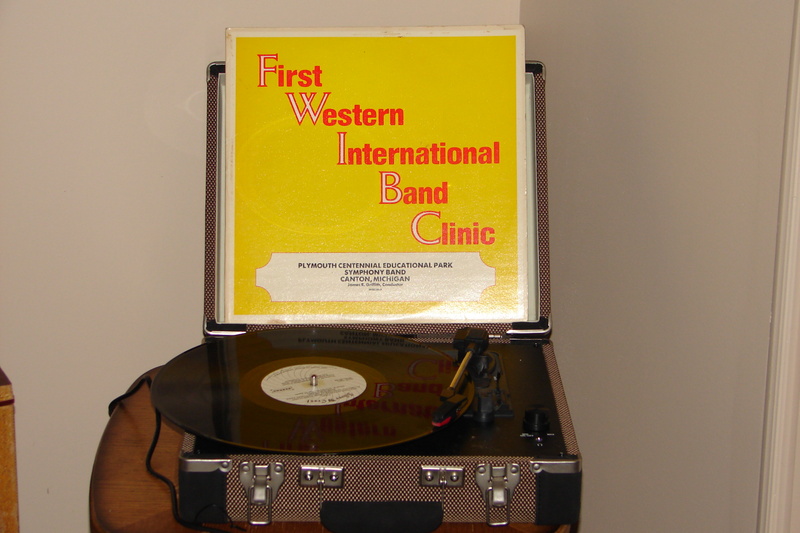 The Symphony Band was invited to a three-day band clinic in San Jose, California on January 17-19, 1980. There were ten pieces of music that we prepared and labored over leading up to the trip. On January 17, 1980, we performed the concert at Ann Arbor’s Hill Auditorium, for parents and to give us a dress-rehearsal and sending off before flying to the west coast. We were scheduled to be the final performance at the clinic, which featured eight bands from around the country, on Saturday the 19th. 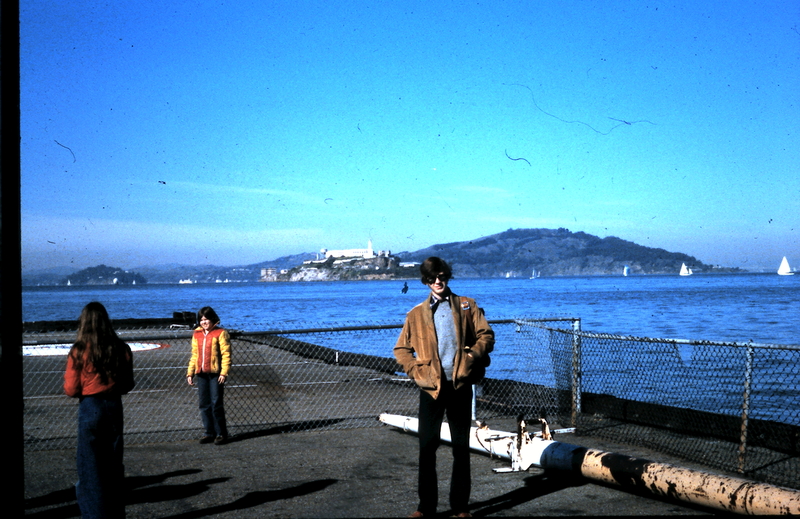 Then, as a group, we toured San Francisco Sunday and Monday, taking the red-eye out of San Francisco, returning home Tuesday morning. An interesting and challenging variety of pieces. The marimba solo on Side One featured Martin Jabara, a Plymouth graduate who was performing with the Pasadena Chamber Orchestra, the San Gabriel Symphony, and doing freelance work in Los Angeles. Within Dreams of a Psychopath (Side Two) there were three improv solos which featured Mark Thrasher on alto sax, John Upton on trombone (who worked in the tune Do You Know the Way to San Jose? into his solo), and Ted Hennig on tenor sax. The Rudy Wiedoeft tribute (Side Three) featured Mark Thrasher as soloist, and to this day, when I listen to that piece, I still shake my head and wonder, “That’s really a high school kid?” Mr. Thrasher was quite gifted musically. Not surprisingly, he’s in New York City, now, performing in musicals on Broadway with all variety of reed instruments. Shockingly, Mr. Griffith selected two pieces that included a few measures for a baritone solo. Zebulon and Children’s March. Darcy and I split them. I had the few bars in Zebulon, and she took the measures in Children’s March. Graduation came in the spring, the baritone returned to the high school, and the trumpet enclosed within its case, never to be played again by me. My daughter tried to get into the band in sixth grade with it, but she had less desire to play the thing than me (though the band director certainly wanted the old Bach Stradivarius in his ensemble). We didn’t push it, and she went on to writing for the high school paper and the swim team. One double-album record has so many layers of memories embedded into it. Some fond, others, not so-much. 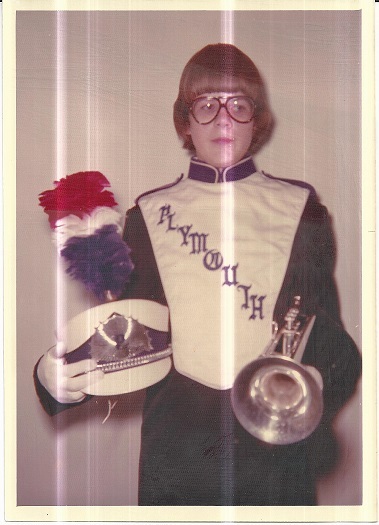 Our kids didn’t pursue music, even though my wife was the band president of her high school in Romulus, and went on and played a year in Eastern Michigan University’s marching band. And though my sister’s music career ended in high school like me, Marie continued the tradition with her family. All four of her kids were or still are in the Fort Mitchell, Kentucky school band programs. Marie and her husband Rob, attended a Kenny G concert in Cincinnati a few years back. They also had backstage passes where they got to meet the musician. I remember Rob telling me that he asked Kenny G about getting a kid to practice. He told him that the music was either in the kid or not. If it is, you’ll never need to tell them to practice. They’ll do it because they want to, because they desire to make music. If it isn’t, forcing a kid to practice would make him or her less inclined to do what they aren’t inspired to do in the first place. Not to toot my own horn, of course, but it’s all good. On the 39th Anniversary of the performance, my friend Bob Young and I co-hosted an internet radio show playing the music from the concert and talking about the trip and times. Would you like to hear a little? Below I recorded The Wedding Dance, the final piece we played.